A firm favourite of our chamber music season, Illumina can bring a varied programme from Bach to the 21st Century. It is always a fantastic experience to hear their antiphonal music making! 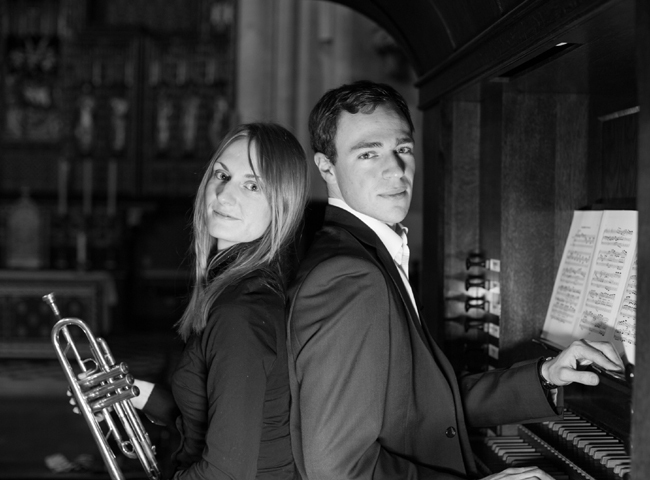 Trumpet and organ duo Illumina is formed by trumpeter Ellie Lovegrove and organist Richard Moore. First meeting as Royal College of Music alumni in 2012, they have since performed in venues including St Paul’s Cathedral, Trinity College, Oxford, Alexandra Palace, and Winchester Cathedral. Keen to promote modern music, Illumina commissioned a work from young composer Paul Burke: the Five Poems, which was premièred as part of the 2014 London Festival of Contemporary Church Music. Illumina are delighted to be planning their first album, for release on Convivium Records. Ellie and Richard both maintain busy freelance performing careers. Ellie has performed with a large variety of orchestras, including the BBC Concert Orchestra, BBC National Orchestra of Wales, BBC Scottish Symphony Orchestra, Orchestra of the Age of Enlightenment, and Britten Sinfonia. She has appeared on BBC Radio 3 at the BBC Proms, and recently with the BBC Singers from Kings Place. Richard held the William and Irene Miller Organ Scholarship at St Paul’s Cathedral, and after leaving St Paul’s, he spent a year as Acting Assistant Organist of St Martin-in-the-Fields, where he accompanied the three principal choirs in a varied liturgical and concert programme, and on Radio 3 and 4.